Since the end of the Cold War, conventional militaries and their political leaders have confronted a new, brutal type of warfare in which non-state armed groups use asymmetrical tactics to successfully fight larger, technologically superior forces. In order to prevent future bloodshed and political chaos, it is crucial to understand how these unconventional armed groups think and to adapt to their methods of combat. Richard H. Shultz Jr. and Andrea J. Dew investigate the history and politics of modern asymmetrical warfare. By focusing on four specific hotbeds of instability-Somalia, Chechnya, Afghanistan, and Iraq-Shultz and Dew conduct a careful analysis of tribal culture and the value of clan associations. They examine why these "traditional" or "tribal" warriors fight, how they recruit, where they find sanctuary, and what is behind their strategy. Traveling across two centuries and several continents, Shultz and Dew examine the doctrinal, tactical, and strategic advantages and consider the historical, cultural, and anthropological factors behind the motivation and success of the warriors of contemporary combat. In their provocative argument, Shultz and Dew propose that war in the post-Cold War era cannot be waged through traditional Western methods of combat, especially when friendly states and outside organizations like al-Qaeda serve as powerful allies to the enemy. 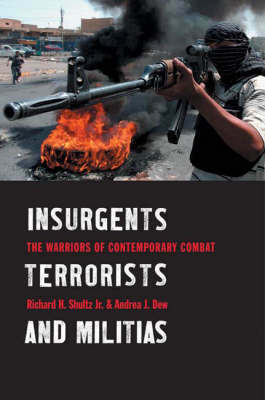 Thoroughly researched and highly readable, Insurgents, Terrorists, and Militias examines how non-state armies fight, identifies the patterns and trends of their combat, and recommends how conventional militaries can defeat these irregular yet highly effective organizations.